Here at KCEconomy, we often get very specific questions about regional data. Our crack team of researchers — staff in the Research Services department at the Mid-America Regional Council — can slice and dice economic data just about any way you want it, and every now and then we like to share some interesting things we run across. The other day, someone asked how the median income of people who work in a specific county compares to the median income of those who live in that county. We’ve heard questions like this before, especially in discussions about whether the wages of teachers, nurses, policemen and firemen are sufficient to allow them to live in the communities they serve. Unfortunately, the data we have on where people work only tells us the wages of workers, not the incomes of their entire households. Therefore, the best we can do is to compare the wages of workers with the wages of working residents. To get a better understanding of commuting patterns in general, we first evaluated where people live in relation to where they work. The table below comes from commuter data released in March 2013 as part of the Census Transportation Planning Package (CTPP), which is based on the 2006-10 release of the American Community Survey. It compares county of residence with county of workplace for eight counties in the MARC region. Overall, 35.5 percent or 317,702 individuals work in the same county where they live. The other 64.5 percent, or 576,413, commute to another county for work. Jackson, Johnson, Wyandotte and Jackson Counties are the only counties who are net importers of workers. For example, Jackson County employs 355,666 workers while it is home to 310,653 working residents, a difference of about 45,000. Similarly, Johnson County employs approximately 16,000 more workers than it has working residents, while Wyandotte County employs about 9,300 more workers than it has residents who work. The CTPP is being released in stages, and does not yet provide data on the wages of the commuters. Another data source does, however – the Area Profile from a Census Bureau product called “On the Map.” It divides the data two ways: working residents, regardless of where they work, or workers, regardless of where they live. The table below shows data for Wyandotte County, Kan. 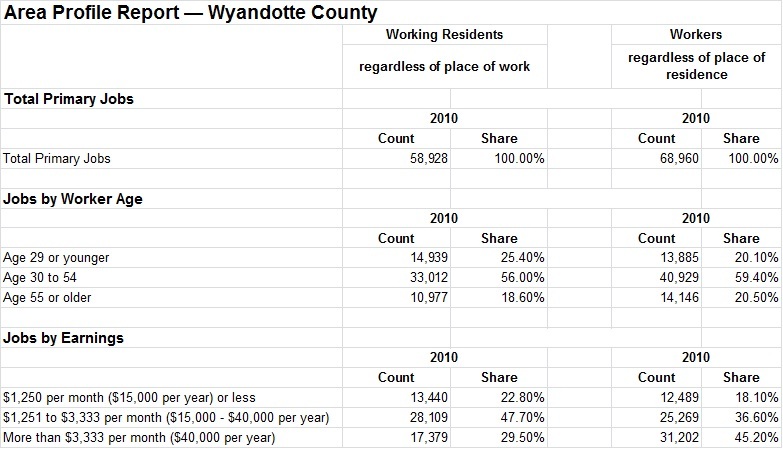 According to this data, 45.2 percent of Wyandotte County’s non-resident workers have annual wages of $40,000 and above, while only 29.5 percent of its working residents are in that wage group. On the other hand, the working residents of Wyandotte County have a greater representation in the two lower wage groups than do its workers. While we can’t make a definitive origin-destination connection by wage group, it is apparent that the wages of non-resident workers are higher than those of working residents. ← Going to Kansas City, or is Kansas City Going to You?